Season series: It's the second of three games between the teams this season. On Oct. 12 Henrik Zetterberg, Pavel Datsyuk and Daniel Alfredsson had three points each as the Detroit Red Wings beat the visiting Philadelphia Flyers 5-2. 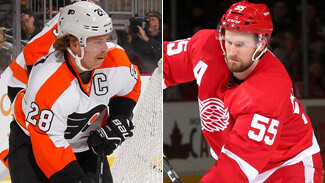 Big story: How will the Red Wings cope with their first line sitting in the press box? Henrik Zetterberg is out at least two weeks with back issues, Pavel Datsyuk is working his way back from a concussion and Todd Bertuzzi has a shoulder injury. The Flyers will look to get back in the right direction as they continue their six-game road trip in Detroit, a place that has been a house of horrors for them. In their previous 19 regular-season games at Joe Louis Arena, dating to Nov. 1, 1989, the Flyers have one win, 16 losses and two ties. They also lost twice there during the 1997 Stanley Cup Final. Flyers: The Flyers seemed to have rediscovered their offense during a recent 11-game run that saw them score 35 goals while going 8-2-1. But their 2-0 loss to the Minnesota Wild on Monday reminded captain Claude Giroux of the early-season struggles that saw Philadelphia score 22 goals in its first 15 games. Minnesota limited the Flyers to 21 shots on goal, including four in the first period. "Same story as the start of the year," Giroux said. "We just need to get more pucks to the net and maybe more traffic and the puck will start going in." Goaltender Ray Emery played well in making 19 saves and keeping the game scoreless until the third period, but Giroux said the Flyers can't just rely on strong goaltending. "I think we played a good game defensively and [Emery] did a good job of shutting the door a little bit," he said. "We just have to have a little more at the other end." Red Wings: Zetterberg is no stranger to back problems, so he knows when he can push through the pain and when he has to take some time off. This time it's the latter: The Red Wings disclosed Tuesday that Zetterberg has a herniated disc in his back and will sit out at least two weeks with the hope that the rest will allow him to heal. "We just have to see how I respond to the treatment," Zetterberg said. "We've got to give it a couple weeks just to let it settle down and we'll go from there. "I've been through this before so maybe I'm a little bit calmer now than when it happened last time." A two-week rest would see Zetterberg return for a Dec. 19 game against the Calgary Flames, meaning he'll have missed seven games. Who's hot: Giroux has four goals and 11 points in his past 12 games for the Flyers; in his first 15 games he had no goals and seven points. … In four games since returning from a two-week absence due to a groin injury, Alfredsson has four goals and three assists. Injury report: Flyers center Vincent Lecavalier will miss a second straight game due to back spasms. … In addition to their top line, the Red Wings also are missing defenseman Danny DeKeyser (shoulder).